Thatch Roof Publishing, 9780980865387, 238pp. Have you ever had the notion that there is so much more to life than the normal every-day humdrum routine? There is. Immerse yourself in Jack and Carrie's exotic lifestyle as they guide you effortlessly towards a new way of vacationing in "Another Cocktail Please." While there are many destination specific and budget travel books there is no other essential guide to long term vacationing. This inspirational, informative guide tugs on your heart strings and engages you to expand your horizons. Enjoy travel, leisure and exploration, each time somewhere new and intriguing, with their blueprint to creating the perfect holiday. 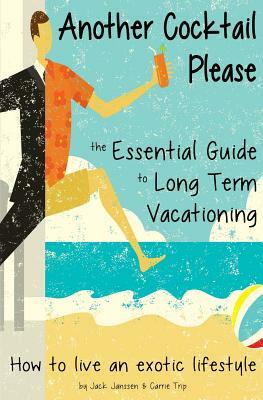 The authors approach to an extended vacation lifestyle offers readers a thought provoking and insightful, how-to anywhere, anytime. They ease the worries and frustrations of planning world-wide trips, eliminate any hesitation and leave their audience brimming with a renewed zest for life. It's a big wide world out there - so where do you start? Known as "seasonal nomads" Jack and Carrie venture to a new destination and live abroad for five to six months every year. Still in their working years they describe how they have escaped the traditional work week and enjoy extensive, diverse holidaying. Merging a conventional lifestyle with a nomadic twist, teeming with excitement and adventure, Jack and Carrie share their wealth of expertise with all would be travellers - whether your holiday is for one week, two months or longer. Anyone who has ever felt trapped by the constraints of work and time yet can't imagine the possibility of life outside the norm, will be intrigued by the perceptive tips and tales contained in this must-have, effective strategy of "how to live an exotic lifestyle." Jack and Carrie, are proof that living this lifestyle is attainable on most budgets - modest or luxury. Living the adage that life is short they urge you to not only discover what excites you - but to actually live it.